1) As a marketer, any sort of statistic seems to be fair game to get a point across – even if it makes no sense. It just has to sound impressive. So go forth and make your claims. 2) As a consumer, do as Ben Franklin said: “Believe none of what you hear and half of what you see.” Particularly when statistics are involved. So do not believe the claims made by marketers. At least not at face value. – If it ‘saves 88% more’, then what does a one-gallon urinal save? If a one-gallon urinal uses any water whatsoever it isn’t saving anything. Unless it’s saving relative to a two-gallon urinal, if such a thing still exists. What they actually mean (according to the website) is it uses 88% less water than a one-gallon urinal. In any case the claim is pure gibberish. On the other hand, it gave me something to read at a key time. Example 2: A local security company claims: “Homes with a security system are 15 times less likely to be burglarized.” I have taken a lot of math, and I don’t know how to calculate ‘x times less likely’. What is this fixation with silly statistics? Perhaps this is what happens when copywriters are given numbers to work with. Other examples focus on a big number to make a point. Example 3: Several years ago Colgate UK made the claim that “80% of dentists recommend Colgate”, implying that the other 20% recommended all other brands combined. In reality, dentists were able to recommend multiple brands (not implying preference), rendering this impressive-sounding statistic meaningless. Example 4: Innocent water company made a product, This Water, that had its advertising banned. The reason? They claimed it was “90% fruit juice and water” and neglected to mention the up to 42g of added sugar. Oops. The brand has since relaunched as Juicy Water. They dropped the 90% claim but still work to get #s in their product descriptions. You may object to the practice of statistical sophistry, but it seems to work. A 2008 study conducted by the Booth School at the University of Chicago (does this surprise you?) observed that consumers are swayed by specifications. In other words, size, so to speak, does matter in purchase decisions. – A study of Chinese shoppers showed they would pay 5x more for a 5 megapixel camera vs a much cheaper 1 megapixel camera, even though they objectively judged the quality of the photos to be identical. – Other examples use sesame oil, towels, potato chips and cellphones and generally demonstrate that specifications influence choice even if personal experience is available and the specifications don’t provide additional information. Apparently, consumers love numbers and are generally susceptible to being influenced by them. A 40-year old classic, I Can Sell You Anything, by Carl Wrighter, does a great job explaining how this and other advertising sleight of hand works. Yes, marketers take advantage of how consumers are wired. This is not news and is not changing any time soon. There’s a lot more to cover on this topic, so expect a follow-up installment soon. Posted in Marketing and Media, Marketing Strategy and tagged 80% recommend, 88% more water, Benjamin Franklin, Booth School, Christopher K. Hsee, Colgate UK, EcoVantage, Innocent, Juicy Water, preference, Specification Seeking: How Product Specifications Influence Consumer Preference, statistics, This Water, University of Chicago, urinal, Yang Yang, Yangjie Gu, Zurn. Bookmark the permalink. It appears that urinals are a hot topic. The folks at Restroom Direct can one-up your EcoVantage Urinal valve. 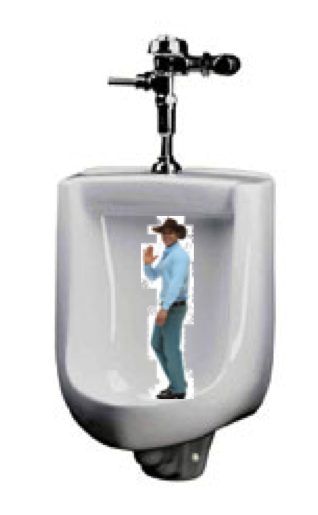 Their Waterless Urinal (ugh!) claim; “Did you know a Waterless urinal saves on averate (sic) 20,000 to 45,000 gallons of water a year?”. Man, how many times do you have to not flush to save 45 THOUSAND gallons?! Nowhere on their site do they offer any proof of this claim. Moreover, I’m not sure it’s such a great thing anyhow. Call me old fashioned, dinosaur, etc., but in my humble opinion, “waterless” and “urinal” are two words that just don’t go together. Gotta go now . . .